What's waiting to tempt you down this beta path? If you're among the many of us paranoid about malware or getting tricked by a deceptive website, Samsung's introducing a protected browsing mode that verifies the pages you're visiting against a list of known nasties (with a little help from Google). 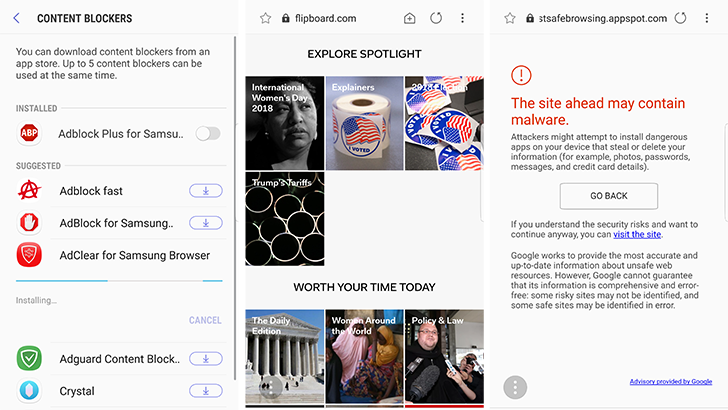 For sites you're still interested in visiting, but maybe don't want to see with so many ads or would prefer not to let them track you, Samsung's tweaking the way content blockers can be added to its browser. When running this new beta on Samsung devices with the Galaxy Apps store present, you can easily install blockers right from within Samsung Internet itself. One of the best things about Samsung Internet is that it's built on a dependable Chromium core, and this release updates the engine to Chromium M59. That move promises enhanced rendering performance, especially with demanding content like web-based games. It won't be an issue with the Galaxy S9, but less well-equipped hardware will benefit from a more memory-efficient tab switcher (designed for sub-1GB handsets). We also see one-touch URL-bar access to reformat news articles for the browser's Reader mode, and a similar one-tap interface for saving web apps to your home screen. The new Samsung Internet 7.2 Beta is currently spreading to users through the Play Store, or you can jump right to the chase with an APK Mirror sideload.